Singapore has seen the completion of its 100th LNG bunkering operation. FueLNG, a joint venture between Keppel Offshore & Marine Ltd (Keppel O&M) and Shell Eastern Petroleum (Pte) Ltd, says it completed its first LNG bunkering at the port in September 2017. "This milestone is testament to FueLNG's ability to provide safe, cost-efficient and reliable LNG bunkering for our clients. We are optimistic that the industry will increasingly adopt LNG as a marine fuel and look forward to furthering our partnership with industry stakeholders to build a world-class LNG bunkering network in Singapore,” said Chris Ong, Chairman, FueLNG and CEO, Keppel O&M. 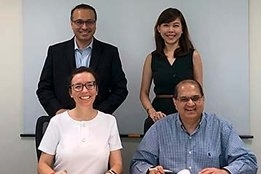 As part of its ongoing efforts to continue the push for an uptake of LNG bunkers, Keppel Friday also announced it has signed an agreement that sees it join forced in the area with DNV GL. The pair say they will work together in a number of areas including potential newbuilding projects for LNG bunker vessels.